Or how to grow pole beans properly. A photograph taken of Esperanza’s then garden. 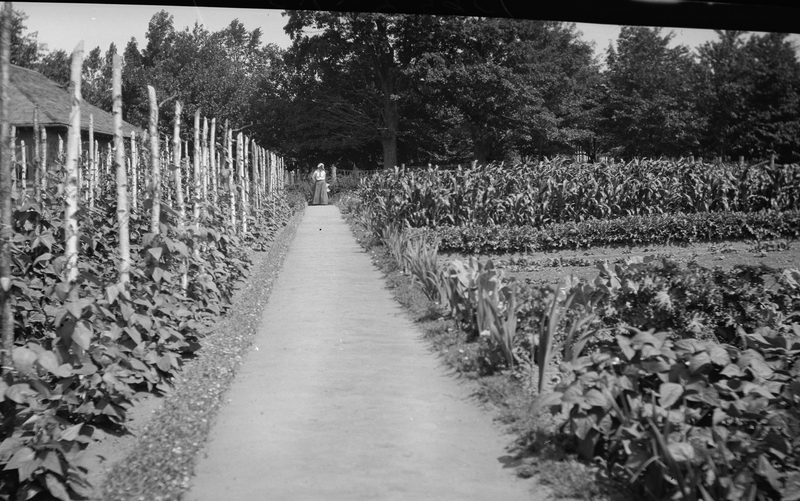 Remember, it supplied the tenant farmer, his family, and Aunt Carlotta (pictured at the far end of the row) over the winter; it supplied all the guests at Esperanza, ranging from a constant 5-8 with spikes of close to 20 for weekends throughout the summer. The garden shown is no longer part of the property, that section was sold off in the 1960’s and is now a winery. My pole beans don’t look like that. Not only are poles not big enough, but this time around in addition to the turkeys, there was a nice young doe taking a nap….they are now netted. Esperanza Farm? The ‘Farm’ part doesn’t make much sense these days, I’ll admit. Though our hay-field, rented out, still produces close to 35 tons of hay annually, with a decent bit of maple-syrup on the side. And when we boarded horses it made sense too. But still…. The Farm part really came from the dairy farm, you can just see an edge of the creamery there, which ran during the early part of the 20th century. It produced enough milk that they could sell milk. I’d give quite a bit for a milk bottle stamped Esperanza Farm, but I’ve never found one, and I don’t think the neighbours want me digging in the former dump!